On Saturday night at 2:15 A.M. Eastern Time (really early Sunday morning), Turner Classic Movies will run a genuine rarity. 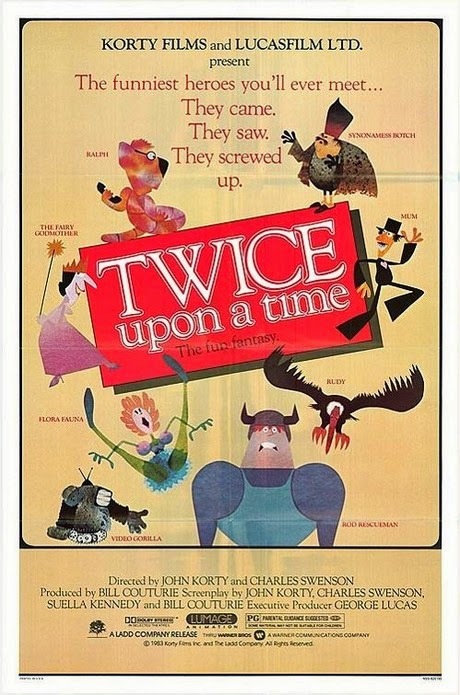 Twice Upon a Time (1983) is an animated feature that uses backlit translucent cut-outs in stop motion produced by George Lucas and directed by John Korty and Charles Swenson. The film has never been on DVD and rarely runs on television. The film features voice work by Lorenzo Music and Paul Frees. There are many names in the crew recognizable from other work, such as David Fincher (who did special effects), Henry Selick, Kaj Pindal, and John Van Vliet. TCM's blog Movie Morlocks discusses the career of John Korty and the circumstances surrounding the making of the film. Ward Jenkins collects a bunch of YouTube clips and interviews Harley Jessup, the art director of the film. The 1980s were an odd decade for animation. Disney was rebuilding, Don Bluth was attempting to overtake them and Bakshi was in his rotoscope period. The decade also saw lots of independent animated features that were interesting but failed to have much box office success. It wasn't until the later '80s, when Disney got back on track and Spielberg got involved with animation that a new normal was established. Prior to that, films like Twice Upon a Time, Heavy Metal, Grendel Grendel Grendel, The Plague Dogs, Rock and Rule, The Adventures of Mark Twain and When the Wind Blows were looking to take animation in new directions, but due to inexperience and audience prejudices, they failed. While these films had small, but professional budgets, this kind of film is made today on a shoestring by independents like Bill Plympton, Nina Paley and Signe Baumane. If those types of films are interesting to you, take a look at Twice Upon a Time. I remember seeing Twice Upon A Time years ago on Cartoon Network. Speaking of Plague Dogs, I found that to be the single blandest feature so far, both as an R and as an animated film. A very fun movie. Not "great," but very fun, and beautiful and funny. Some top talent worked on it, including Harley Jessup, Henry Selick, and David Fincher. One of my favorites from the 80's. I actually prefer the family-friendly cut over the more adult-oriented cut. The punched-up dialogue in the latter often comes across as forced. I have the opposite opinion, Torgo25. I thought that the swearing gave it a little bit more punch and the movie was somewhat boring without it. The family friendly cut, contrary to rumors that have spread over the internet is the original version though. Oh, man! I have not seen this since it ran on Star or First Choice channels in the 80s. When it made its premier on payTV I watched it as many times as I could. It's one of the films that made me admire George Lucas even more because it was so unusual. I don't have Turner, so I may just have to rely on the Internet.…unless someone knows if it's on netflix or iTunes store? I should also mention, whenever I talked about Flash animation being pin puppet animation, this is the movie my brain sees. I had completely forgotten the name though.